I am grateful to Rabbi Avraham Moshe Wasilski, Rabbi Meir Wasilski, Rabbi Yakov Horowitz, Rabbi Yehudah Lichter, and Rabbi Moshe Yaakov Rosen (Part I); Rabbi Shlomo Aharon Gottleib (Parts I and II); and Rabbi Leibel Berger and Rabbi Chaim Kramer (Part II) for sharing their knowledge of Breslover Chassidus and history with me. However, any mistakes herein are mine alone, and factual corrections are welcome. 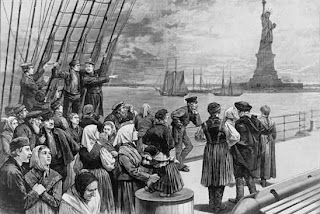 Breslover Chassidim first arrived upon American shores with the masses of refugees fleeing Russian persecution during the early 1900s. Although the names of many have been forgotten, conspicuous among them was Rabbi Elchonon Farber (d. mid-1950s), a Ukrainian Breslover who had known Reb Avraham b’Reb Nachman (author of “Biur HaLikutim” on Likkutei Moharan) and was an accomplished scholar and dedicated Chassid. Another early Breslover in America was Rabbi Yitzchok Mendel Rottenburg (approx. 1891-1991), a well-known personality on Manhattan’s Lower East Side, who lived to witness the rebirth of Breslover Chassidus in this country. The extremely gifted Reb Yitzchok Mendel was born in Poland and traveled to Uman in his teenage years, where he met Reb Avraham b’Reb Nachman and other major Breslov teachers of the pre-Bolshevik period. Then he continued on to Eretz Yisrael, where (although still a young man) he studied kabbalah with the reknowned Sefardic master, Rabbi Chaim Shaul Dweck. He eventually became close to Rabbi Yosef Chaim Sonnenfeld, presiding Rav of Jerusalem’s “Old Yishuv,” and zealously adopted the ideology of anti-Zionism. In fact, Reb Yitzchok Mendel was so brazenly antagonistic toward Chief Rabbi of pre-state Israel, Rav Avraham Yitzchok Kook (1865-1935), that eventually he had to flee the country to avoid being arrested. Arriving in New York in the 1920s, he found a tumultuous immigrant community assimilating as fast as possible, and a Chassidic wasteland. He opened a shul called “Linas HaTzedek” on the Lower East Side and soon found himself leading a congregation, performing weddings, and other public functions. He also served the community as a shochet. Ironically, Rabbi Rottenberg wound up becoming something of a religious Zionist in his later years, and was involved in Agudath Israel of America. Although he went through many changes in his long and eventful life, he remained a Breslover throughout. Among the prominent figures in the New York Breslov community during the post-war years was Rabbi Beirich Rubensohn (Robinson) (1905-1997). Reb Beirich was born in Sosnowicz, Poland, and became a fervent Breslover before he reached the age of bar mitzvah. Tragically, he lost his first family at the hands of the Nazis, but somehow survived five years in the Treblinka and Auschwitz death camps (where at one point he was placed in a gas chamber and miraculously removed at the last second). After the war, Reb Beirich came to America and started a new life. He worked with Vaad Hatzolah of Agudath Israel on behalf of Jewish refugees, and eventually became a successful businessman, who helped build the struggling Breslov kehillah and printed several Breslov seforim. Rabbi Herschel Reichman (d. 1967) was a devoted Breslover from Radomishla, Poland, who similarly helped establish the Breslov kehillah upon his arrival in America and printed the Rebbe’s seforim. As a yeshivah bochur, Reb Herschel overcame all obstacles in order to attend the Rosh Hashanah kibbutz in Lublin, once suffering to travel there atop a farmer’s wagon full of manure. During the last year of his life he succeeded in going to Uman to recite the Tikun HaKlalli beside the Rebbe’s grave. He considered this to be a heavenly reward for the mesirus nefesh he had demonstrated in his youth by traveling to Lublin under such inglorious circumstances. These individuals were joined by a few young people who had become Breslovers via the Breslover seforim. However, if there was any single “moving force” within New York’s Breslov community during this period, it was Rabbi Zvi Yosef Wasilski. Descendent of many distinguished talmidei chakhomim, Rabbi Zvi Yosef (“Herschel”) Wasilski (1922-1981) was born in Vilna, Lithuania, raised in Oszmiana on the outskirts of the city, and at age thirteen his parents sent him to learn in Rabbi Elchonan Wasserman’s famous yeshivah in Baranovitch. He once told one of his students, Rabbi Yacov Horowitz of Monsey, NY, that throughout his childhood he never heard mention of the Baal Shem Tov until he came to Baranovitch – which despite its “Litvishe” auspices was full of Chassidisher bochurim from Poland, including many Breslover bochurim. In fact, many of the top students in the yeshivah were Breslovers. When his father came to visit the yeshivah, the Mashgiach gave a favorable report about the young boy’s progress, but mentioned that he had become interested in Breslover Chassidus. The elder Rabbi Wasilski took his son for a walk, and in the course of conversation he brought up this subject. “I am told that you have become interested in Chassidus,” he said. Nervously, the youth acknowleged that this was so. “Yes,” Herschel replied to both questions. “That’s good,” his father remarked -- and never said another word about the subject. Reb Herschel learned in Baranovitch for more than five years and became a talmid muvhak of Reb Elchonon Wasserman. After World War II broke out, Reb Herschel and the rest of the Baranovitch Yeshivah relocated to Vilna, where the elder Rabbi Wasilski was involved in the Vaad HaYeshivos with Rabbi Chaim Ozer Grodzensky. Despite social upheaval and fear, the bochurim continued to learn Torah for another year. However, when the Nazis approached the city he bid farewell to his father and mother and joined the fleeing refugees, never to see his parents again. Captured by the Russian army, Reb Herschel spent the war years in Siberia, and toward the end in Samarkand. There he got to know Reb Levi Yitzchok Bender, a talmid of Reb Avraham b’Reb Nachman recently arrived from Tashkent, and a few other Breslover Chassidim who had managed to escape the inferno of Europe. For the last two years of the war, he would spend at least an hour every night learning and discussing Breslover Chassidus with Reb Levi Yitzchok, until the armistice was declared. Then Reb Levi Yitzchok went to a DP camp and eventually made his way to Eretz Yisrael, where he became the central figure in the Jerusalem kehillah, while Reb Herschel emigrated to America. Yet their emotional bond remained strong, and they renewed their relationship in better times. Soon after his arrival in New York on Dec. 7, 1946, Reb Herschel, now all of twenty-four, joined the Kollel of Yeshivah Torah Vodaath, and soon became menahel of the evening classes program, a position he maintained from 1959-1967; then he served as a maggid shiur in the mesivta under Rabbi Reuven Grozovsky from 1952-1954. He subsequently worked as melamed in Yeshivah Torah Vodaath, a job he held until his death. Reb Herschel was known as a tremendous lamdan, whom many roshei yeshivos and talmidei chakhomim sought out. Rabbi Yoel Teitelbaum, the Satmar Rov, also took a liking to Reb Herschel, who shared the Chassidic leader’s anti-Zionist political views. He used to call him affectionately “the Breslover Yid, the Litvak,” showed him great kindness, contributed generously to his charities, and encouraged Satmar bochurim to get to know him. Although he was “me-urav im ha-beriyos,” a man who could get along with people from all sorts of backgrounds and points of view, Reb Herschel was a Breslover Chassid through and through, whose profound emunah in the Rebbe made an indelible impression on his family members and talmidim, and who worked tirelessly to strengthen and disseminate Breslover Chassidus in every way possible. He raised substantial amounts of tzedakah for the Breslov Yeshivah in Jerusalem and poor families; intervened in shalom bayis problems (and saved a number of marriages); filled his home with travelers from Eretz Yisrael and other guests in need; and his ahavas Yisrael was boundless. His son Rabbi Avraham Moshe Wasilski recalled that their father never spoke about himself or his accomplishments, even to his children. Many amazing things about Reb Herschel only came to light after his passing, during the shiva. Rabbi Wasilski maintained close ties with Rabbi Shmuel Horowitz (with whom he corresponded for years), Rabbi Levi Yitzchok Bender, Rabbi Elyah Chaim Rosen, Rabbi Shmuel Shapiro, Rabbi Velvel Cheshin (who stayed in the Wasilski home during his visits to America), as well as other zekenim (elders) in Jerusalem. Reb Elyah Chaim stayed with him when he visited America to raise funds for his yeshiva during the 1950s, and Reb Herschel stayed with Reb Elyah Chaim when he visited Eretz Yisrael a few years later. Subsequently the entire Wasilski family stayed with Reb Elyah Chaim, who maintained a separate section of his home for guests. Reb Herschel also was the official representative of the Breslov Yeshiva in America, and he raised not less than one third of the total building costs – a substantial sum. Rabbi Wasilski passed away on 29 Tammuz 5741 / 1981, at the relatively young age of 59. However, he left behind a spiritual legacy that lives on to this day. One of Rabbi Wasilski’s special gifts was the ability to get things done. Within a year of his arrival in America, he established the Breslov minyan on the Lower East Side of Manhattan. First located on Hester Street, then on Montgomery Street, and finally on Henry Street, this was where the 30-40 Breslover Chassidim in New York davenned for many years on Rosh Hashanah, beginning in 1947. 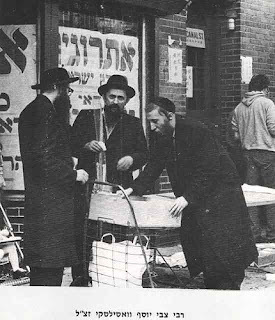 The Lower East Side Breslov shtibel functioned on Shabbos and Yom Tov, and in its heyday there were regular weekday minyanim, as well. Reb Yitzchok Mendel Rottenberg’s Linas HaTzedek shul eventually merged with the Montgomery Street shul. The Williamsburg shtibel on Lee Ave. was established in 1970 by Rabbi Wasilski and his talmidim, and continues to operate under the leadership of his son, Rabbi Avraham Moshe Wasilski. His son-in-law, Rabbi Yitzchok Friedman, gives regular shiurim there and, more recently, once a week in Borough Park, as well. Rabbi Nachman Wasilski is Gabbai of the shul, and also has followed in his father’s footsteps by selling Breslover seforim directly and by mail order. Rabbi Meir Wasilski lives in Borough Park, where he carries on the family legacy as Gabbai of the Breslov shtibel there. Rabbi Noson Wasilski is also a strong Breslover and a gifted baal tefillah. Founded in 1964, the Borough Park Breslov shtibel owes its existence primarily to Rabbi Meyer Kalmanowitz, who became a Breslover during his teenage years through his high school rebbi at Mesivta Torah Vodaath, Rabbi Wasilski. Although he subsequently joined Rabbi Zvi Aryeh Rosenfeld’s group (see Part II), he maintained close ties with Rabbi Wasilski until the latter’s death. Rabbi Wasilski was also actively involved in the establishment of the Borough Park shul. The first building purchased was on Sixteenth Ave. at the the corner of 52nd St. Due to demographic shifts, there was also a need to move the Breslover Rosh Hashanah kibbutz (gathering) from the Lower East Side of Manhattan to Brooklyn. The first Rosh Hashanah kibbutz in Brooklyn took place in the new Borough Park shtibel in 1965. Then in 1967 the shtibel moved to its present quarters a few blocks down Sixteenth Avenue, near the corner of 55th St. The “activists” for the purchase and renovation of this building included Rabbi Herschel Reichman; Rabbi Yaakov Dov; Rabbi Naftoli Reichman; and Rabbi Moshe Yaakov Rosen, the youngest of this group, who later moved to Monsey. (He also helped found the Breslover shtibel there and created Sifrey Breslov, a mail-order bookstore.) Rabbi Leibel Berger, a devoted talmid of Rabbi Rosenfeld, soon lent his energetic and generous support to the Borough Park Shtibel, and was joined by the late Rabbi Yaakov Ehrman, proprietor of the 13th Avenue landmark Kova Hats and a mekurov of Rabbi Yaakov Dov; plus a few other dedicated souls. For several decades, Rabbi Shmuel Breines, a well-known melamed at Yeshiva D’Brooklyn, has served the Borough Park kehillah as a mashpiya and given regular public shiurim. Today the Borough Park shtibel has become more active during the week, with new shiurim and a daily “Vasikin” minyan. Rabbi Yosef Cheshin has also initiated a project to renovate the building’s third floor in order to house a multi-media Torah center. It is intended that this space will be used for special shiurim and to present guest lecturers from Eretz Yisrael. The Breslover shul in Monsey was first established on rented premises during the mid-1970s, until the present building was purchased and renovated in 1984. The founders of the kehillah were Rabbi Beirich Rubensohn and his sons; Rabbi Daniel Bergstein; Rabbi Leibel Landesman; Rabbi Yehudah Lichter; Rabbi Moshe Yaakov Rosen; and Rabbi Yaakov Dovid Rosenberg. An extension was subsequently added to the building, and today the Monsey Breslov shtibel is a vibrant center of Torah and tefillah. A little farther north, the Breslover Chassidim in Kiryas Yoel-Monroe acquired their own shul in the early 1990s. For a number of years Rabbi Noson Liebermentch of Emmanuel, Israel, was the main mashpiya for the Monsey kehillah, traveling to America to give shiurim several times a year (although recently he has been coming less frequently); while Rav Shamshon Schvartz is a key figure in the Monroe Breslov kehillah. Rabbi Yitzchok Mermelstein leads a separate Breslov chaburah in Monroe, which has adherents in other communities, as well. Part II of this posting will present a brief biography of Rabbi Zvi Aryeh Rosenfeld and his legacy of Breslov outreach, particularly through the Jerusalem-based Breslov Research Institute and Breslov World Center founded by his two sons-in-law, Rabbi Chaim Kramer and Rabbi Nasan Maimon. As far as I know, R' Yossi Cheshin's refurbishment plans -- he can give you the artist's images -- include finishing the basement and dramatically improving the Veiber Shul (women's balcony). Most of the men's section ceiling will become two floors high. On top of the lower ceiling area (let's say a third of the total), which will start from the side of the 55th St entrance, will be the Veiber Shul. Women will finally be able to see and hear. Was nice to find this article, which includes my father Rabbi Yakov Dov Z"TL. I have in my possesion a copy of the deed for the purchase of the building on 55/16 with my father's name on it. He travelled throughout the US in the 50's collecting money to buy that building. He led the tefilos there for many years until he moved back to EY. Thank you for mentioning him.